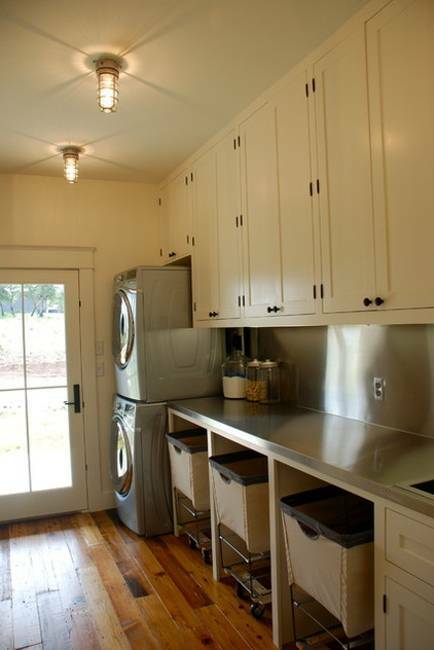 Laundry room design is a very important part of comfortable, functional and beautiful house designs. 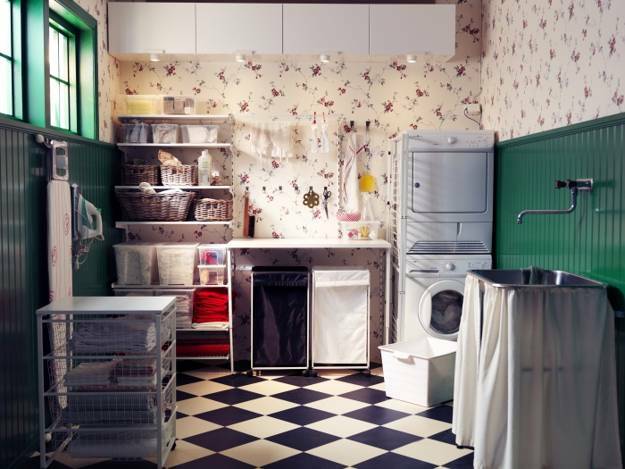 Laundry room ideas can be inspired by decorating small rooms to create bright and comfortable home interiors. 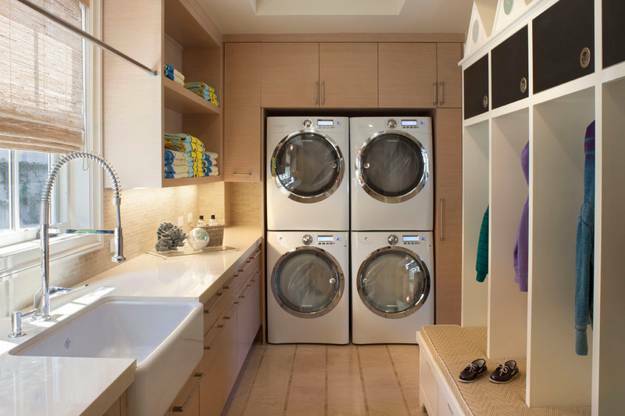 A large laundry room design is a luxurious addition to modern homes, but more often a laundry room is small and does not have a window. Still these functional rooms can be comfortable and attractive. 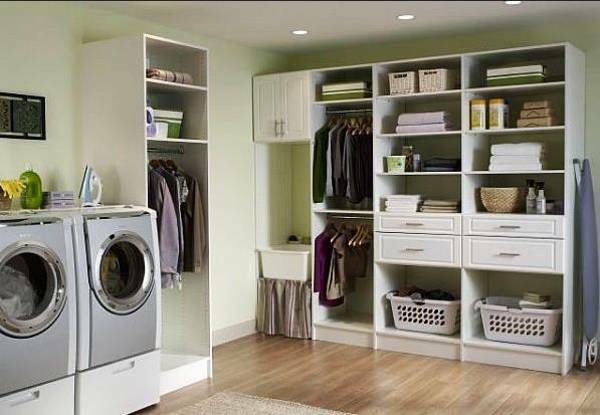 Lushome collection of beautiful laundry room design ideas and smart tips for decorating laundry room interiors from ergonomic design experts show how to create comfort and beauty with practical solutions and modern ideas. 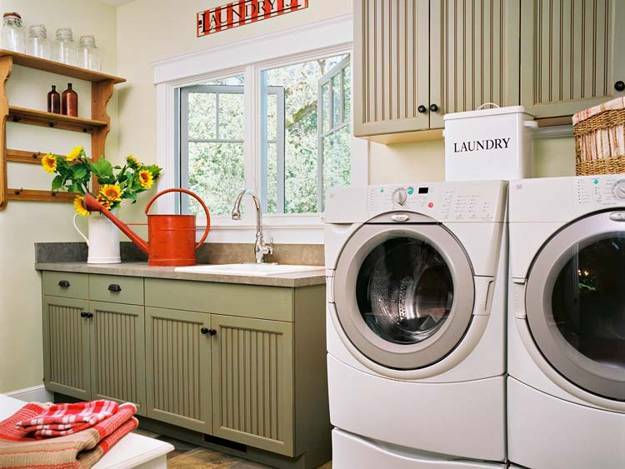 A washer and dryer, a workplace station, storage spaces, a built-in wall ironing board and a sink create very functional and attractive laundry room design. 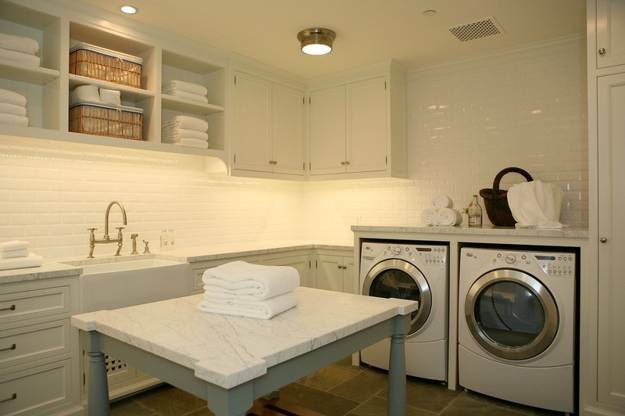 Here are wonderful tips and modern ideas for design and decorating of a laundry room in elegant, ergonomic and comfortable style. 1. 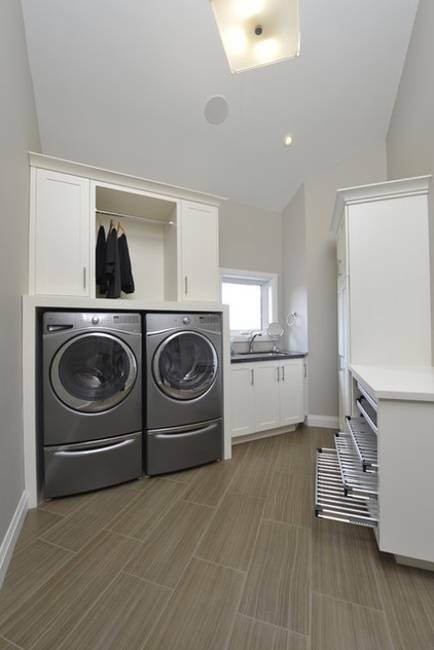 Lifting a front-loading appliances becomes a popular trend for laundry room design. The comfortable height for women is 30-36 inches from the floor, and 33-39 inches for men. 2. 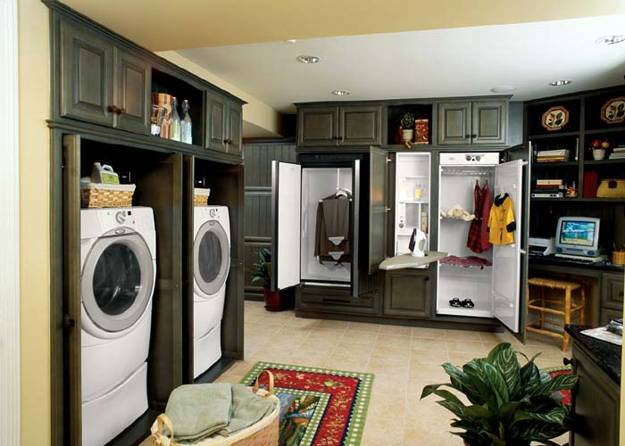 Energy saving and water saving home appliances are another strong trend in laundry room design today. 3. 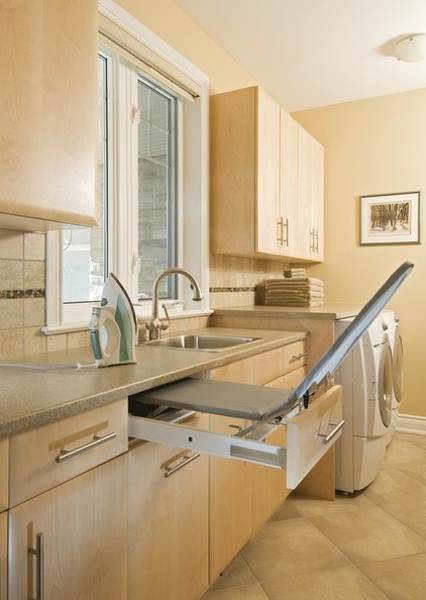 A comfortable table for folding laundry is slightly lower for ergonomic laundry room design. 4. 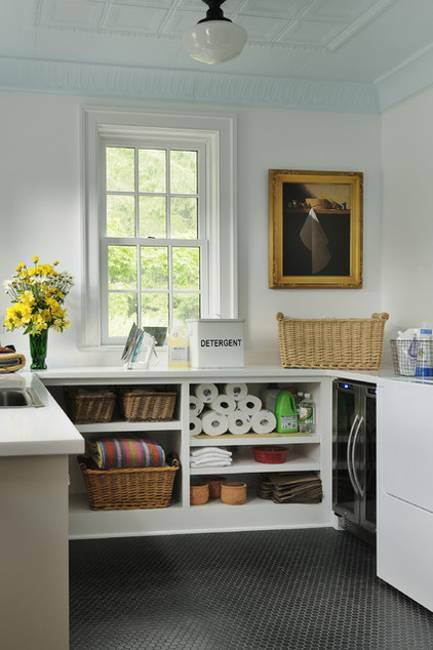 Laundry baskets on wheels with soft or rounded edges are practical, convenient and modern ideas for laundry room design. 5. 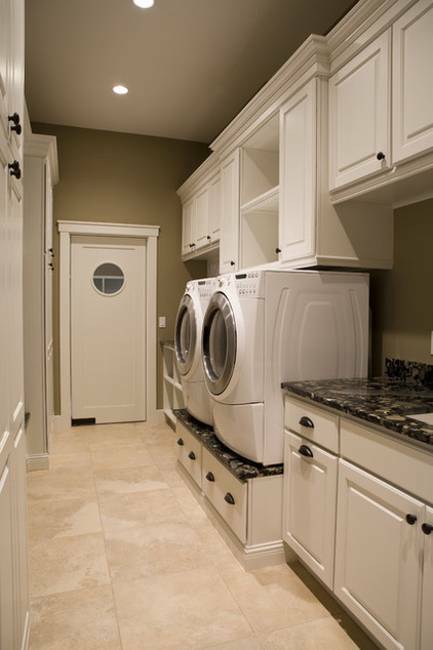 Ceramic or stone floor tiles are good flooring ideas for a modern laundry room. 6. 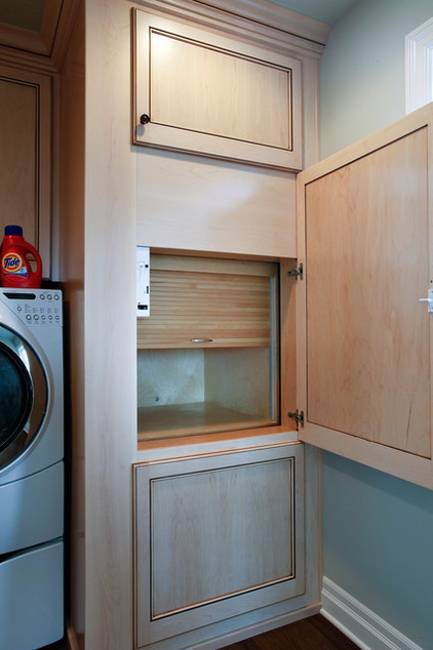 Open wall shelves and cabinets with doors are two alternative storage and organization ideas. Open wall shelves are modern ideas for small rooms. 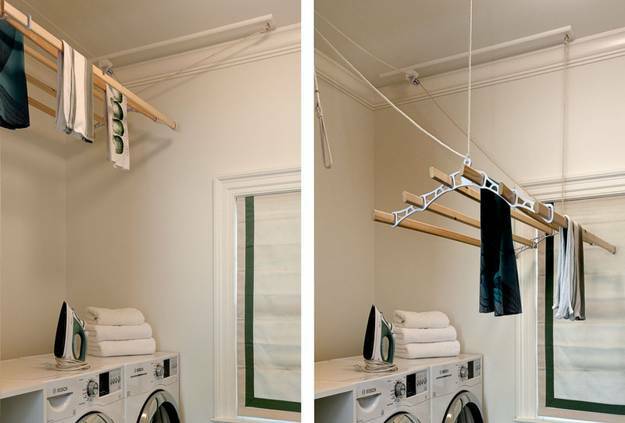 Open wall shelves and suspended from the ceiling racks allow to keep small rooms look spacious while providing convenient storage. 7. 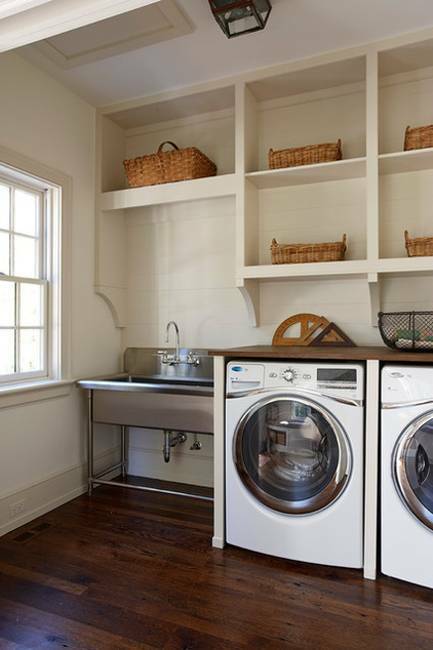 An extra deep laundry room sink, place at 42 inches from the floor, is a practical and ergonomic idea for comfortable and modern laundry room design. 8. 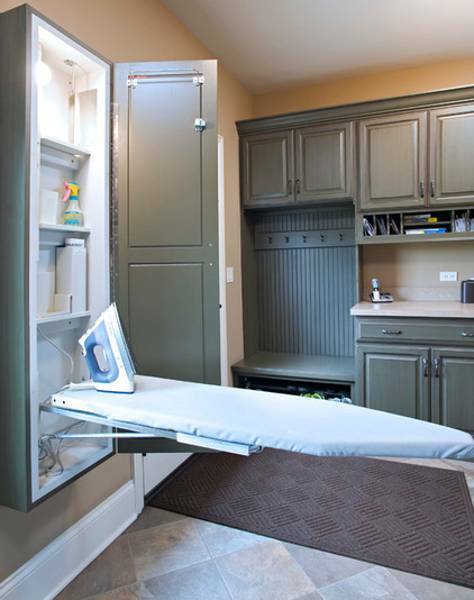 Built-in a wall ironing boards are space saving and smart ideas for small laundry room design. 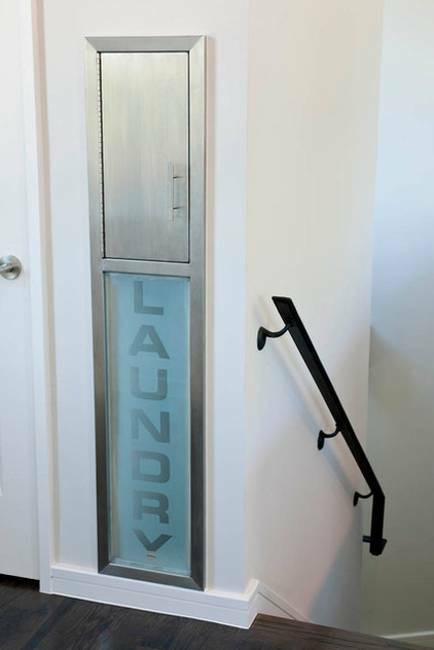 Built-in wall shelving systems offer enough storage spaces for an ironing board and small items that everyone needs in a laundry room. 9. 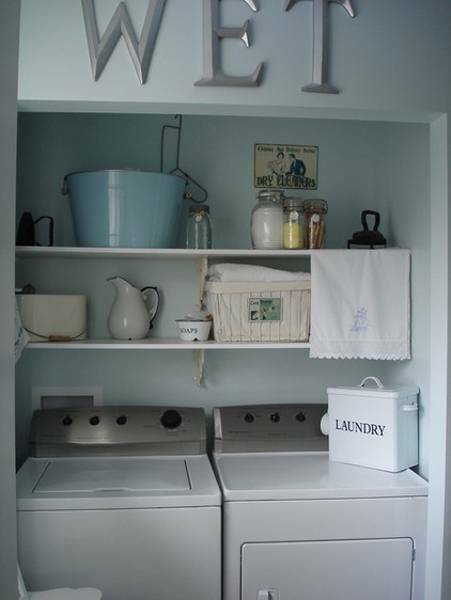 A creative, simple and eco friendly rack for drying clothes is a nice Green idea that adds a unique accent in vintage style to decorating a laundry room. 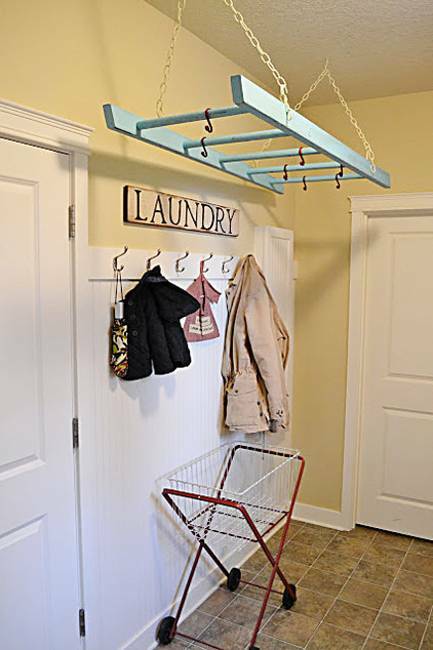 Handmade, suspended from the ceiling wooden racks look fabulous in a functional and bright laundry room bringing unique vintage style charm into decorating. 10. 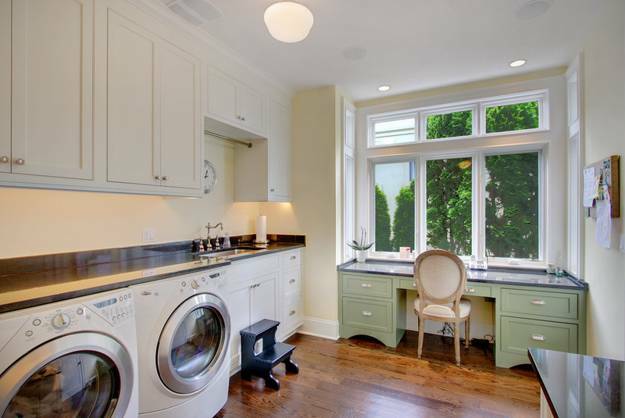 Add a chair to improve decorating of your laundry room by adding a comfortable and attractive seat to laundry room design. 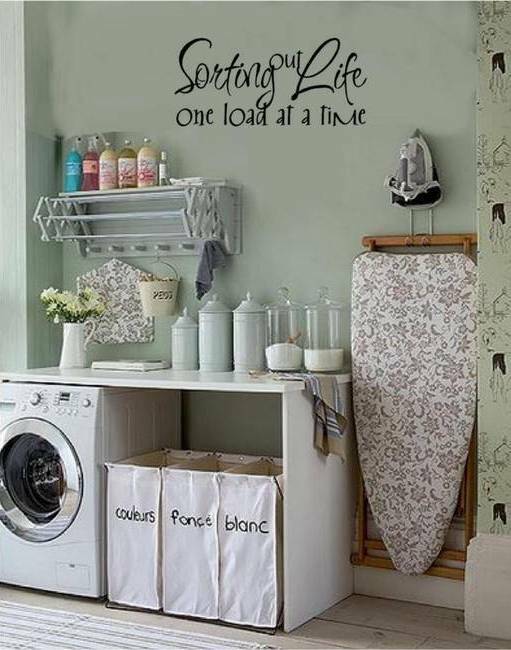 One or two stools or a char are simple, ergonomic and modern ideas that add elegance and chic to decorating a laundry room in any style.